We are excited to announce the new 2016 Sting.com Membership Package. 100% certified organic cotton canvas with a large open main compartment 20” wide X 14” long X 7” deep. Outside pocket and inside pocket. Inside key ring holder. Perfect for picnics and festivals. First access to backstage interviews, behind-the-scenes and rehearsal footage and studio takes, plus archived interviews and articles documenting Sting's career. Members get rare, inside perspectives, and we strive to provide news of Sting's upcoming projects, performances, and musical endeavors before anyone else. 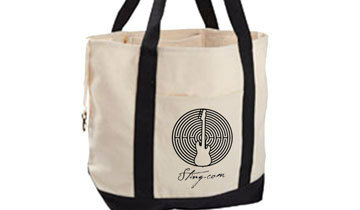 Also, gain access to the 'Labyrinth,' the official Sting online community and message boards. Members receive a 25% coupon good for one purchase in the official Sting.com store, in addition to discounts from 5% - 25% on all items in the store. The ability to shop in Pounds, Euros, or Dollars offers an easy and efficient shopping experience. There are a number of exclusive member perks to joining the Sting.com fan club - from tickets to invitation-only concerts and TV tapings, to merchandise and music giveaways, and much more. If you are not currently a member and would like to join now, click here to join. If you are currently a member and would like to renew now, click here to renew.